the beauty in the unexpected. I knew little of him as he joined us. But, I did know there was something special- something different- about him. I found myself praying for this complete stranger the entire hour and a half we were in the air. It was like my soul was aching to intercede, to cry out for him. Once I spent time with David (not his real name, but it seems weird to not call him something) it made total sense why the Holy Spirit was calling me to cry out for this man. Funny, how when God gives us an aching it often doesn’t make sense in the moment, but later, when details are filled in, it is crazy how much sense it makes, right? I got to know David as we spent the next few days together. One evening Pastor John (one of the South Sudanese pastors) paired the two of us together; ” Tomorrow we are going to the churches in the refugee camps and we will preach. Are you all ready to preach?” Wohoo, I thought, this is crazy awesome. Yes, Lord, yes. God knows how much I love spontaneous and the unexpected, like I love being pushed outside my comfort zone. “David you will go with Alisa. David will give his testimony and Alisa, you will preach.” I looked over at the sweet tempered man, who constantly wore a pleasant smile on his face. He was easy to look at, so easy that my eyes were often drawn to him. He had a peace about him… a peace that my heart was constantly seeking- longing- for . 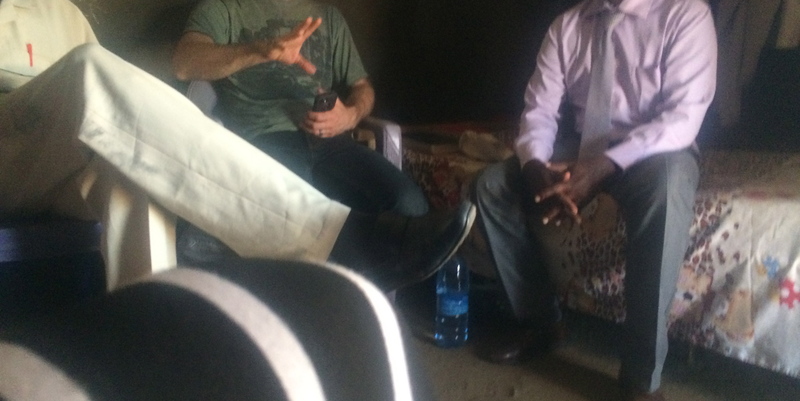 I learned that this man with a gentle demeanor, who stood no taller than 5 7′, was formerly part of Sudanese army and a devout Muslim.And it was an American girl who shared Christ with him. “She was about your age,” he explained as we walked from the church back to the buses, “Wait, how old are you?, David asked. I am forty one. He started to laugh and stopped walking. I thought you were in your twenties. Yeah, see, I knew there was a reason I loved this man. haha… “She talked to me as if she knew me. That there was already a deep love for me,” he shared. Oh, dear sisters, may all quake and tremble in fear of the power and magnificence of our Lord. David has committed his life to preaching the gospel and sharing Christ with Muslims even though they still seek to take his life. Currently his picture has been circulated throughout the land and a bounty put on his head. His very life is at stake every day- every hour. Oh dear God, what has he endured because of your name? What must that be like, dear God? Does he consider it a privilege? Does he fear it? My heart ached and cried out to God as I spent time with David, talking about how he met the Lord and what it is like for him to follow Christ. Lord, why do I long for what he has? I mean not the pain, definitely not the tortured and fearing for my life, but I long of the peace- the sacredness- that seems to reside within him. I am starting to think dear sisters, that the more we suffer, the more we see Him- Christ- for who he is. When we most need to be saved… we see a Savior. When we most need to be rescued… we see a Rescuer. When we most need someone to fight on our behalf… we see a very able- powerful- Warrior King. Oh, dear sisters, let us lift up those who have been called to risk their very lives so that others may get a glimpse of our beautiful Savior- Rescuer- Warrior King.